Today we say goodbye to Terry Jeggle. The world, particularly those who dream for a safer world will long remember him as a champion of disaster risk management; the soul of the “Living with Risk” in the ever increasing disaster risk world; and a man who cared personally and professionally for so many of us in the most generous and collegial manner imaginable. Terry served ADPC as the Director between 1992- 1995, an era important to remember today. ADPC as an outreach center of AIT was moving towards an institution by itself. ADPC’s development as important focal point for promotion of disaster management in the region continued through 1992, a fitting compliment to the global observance of International Decade for Natural Disaster Reduction (IDNDR). 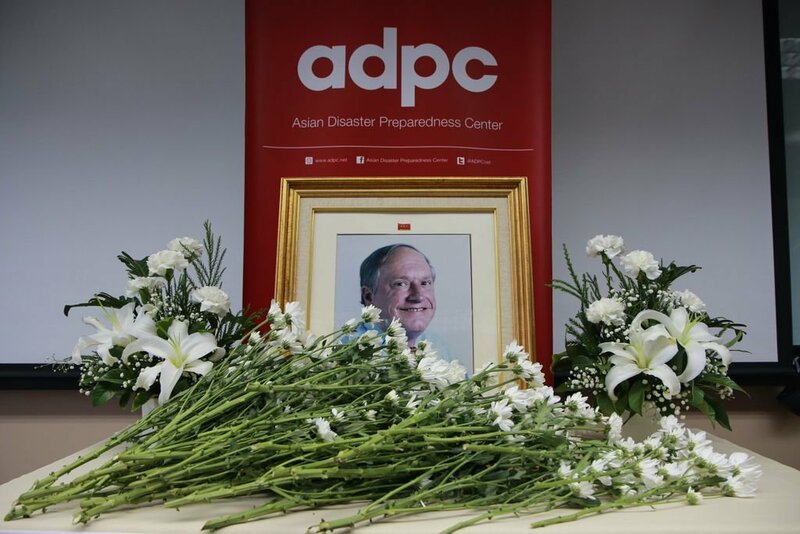 Under the Directorship of Terry, ADPC’s general, technical and information program expanded to address the relationship between disasters, environmental and development. But those of us who loved him, and ache with his passing, know Terry by his contributions to the global framework popularly known as the Hyogo Framework for Action (HFA) Disaster Risk. The book “Living with risk: a global review of disaster reduction initiatives” provided guidance, policy orientation and inspiration, as well as served as a reference for lessons on how to reduce risk and vulnerability to hazards and to meet the challenges of tomorrow. He was the main author on behalf of UNISDR. Terry has connected people – many of them through ADPC. He always shown his unconditional support to Col. Brian Ward and continued to guide ADPC in the best way possible. The documentation of ADPC on its 25th anniversary by him set the narrative of the ADPC’s Strategy 2020. Terry maintained that Disaster management is not a specialist profession. In order to reduce the impact of disaster risk, root causes must be addressed and this should be undertaken by combining the expertise of a many different kinds of people including sociologists, emergency service professionals and development experts. In 2001, Mr. Terry represented ADPC and received the UN SASAKAWA Award, on behalf of Mr. Brian Ward as the “Certificate of Distinction”, the highest so far to ADPC institutionally or individually. As you know so well, the passage of time never really heals the tragic memory of such a great loss, but we carry on, because we have to, because our loved ones would want us to, and because there is still light to guide us in the world from the love they gave us.” We carry on. Terry has gone, guided by his faith and by the light of those that he has loved and lost. At last he is with them once more, leaving those of us who grieve his passing with the memories he gave, the good that he did, the dream he kept alive. May God bless Terry, and may he rest in eternal peace.